Guys, I'm trying to transfer my byteballs using desktop wallet, but the wallet keeps giving me this error: "[Internal] connection closed". Does anybody know how to solve this problem? Gbyte is great. But you may be silly. Yep, the person is the problem. I hold Byteball now until we reach 24.000 Dollar (12 Billion marketcap = the same marketcap like iota has). Iam really excited for the ride. User HHugh has made this great teaser video. Click on the video and turn up the volume! Byteball should start a big worldwide advertising campaign with Videos like that. This is the perfect moment, because now the whole world is talking about Bitcoin. We should show the people that there ist the only one coin that is better than bitcoin in in all facets: BYTEBALL. On the last 24h, every MBytes played on binaryballs.com brought back 1.28 MBytes ! Thanks for your reply, I switched hubs several times, but it didn't help. What else could be the issue there? It is a connexion problem in between your wallet and your hub. Disable any firewall you may have and try again. Isn't byteball better than IOTA on may technical fronts? My concern is that the byteball team does not have the funds or connections to compete with IOTA, any thoughts from someone that knows more about this project? Byteball team holds 350,000 GB that are planed to be distributed through combination of airdrop, cashback program, and other methods. We are trying to encourage tonych to reserve a bigger portion of that to fund development team going forward rather than giving it *all* away just to be dumped. Current value of those GB is over $200 million. Although tonych controls a big portion of bytes, he has always handled the reserved bytes with great revere and has not misappropriated funds. Main thing to be improved is actually spending more to expand the dev team beyond 3 and possibly add a small public/press relations team besides community volunteers. There is also a community fund. I strongly endorse this view, funding a larger development team at this stage would be far more useful for the coin than giving it away to dumpers. And I would also suggest the creation of a good marketing team. Agreed. Not sure if marketing team is top priority but I think investing coins on development and other pursuits is better than giving it to people who can sell at anytime for profit because they have a $0 cost base. The Dev won't look dodgy because the money will be used for the benefit of the coin. It won't benefit those who just want free coins of course. But a larger adoption through marketing (and we have seen what a simple reddit advertisement can do) will be good for the existing coin holders. 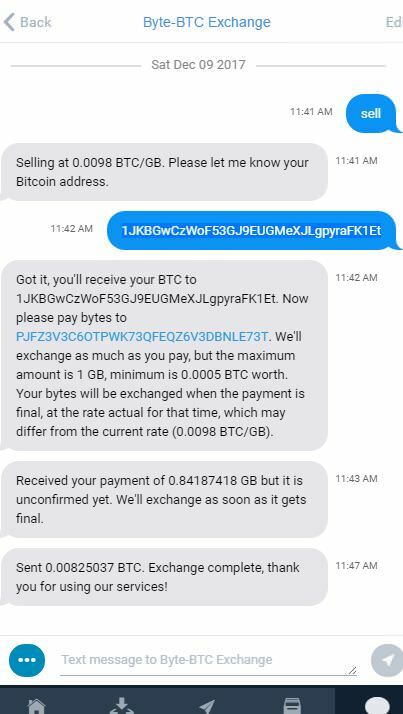 Not very impressed with "Byte-BTC Exchange" part of this wallet when your Byteballs are taken without payment. I imagine a low fee was used or the transaction cancelled as Unconfirmed Parent was displayed in my electrum wallet. I tried a "child pays for parent" but that did not hasten the transaction. Anyone know what went on here and if this is the expected behaviour. Is there any recourse you can suggest to retrieve my Byteballs or request my BTC?